It’s that time again, trend seekers. Orange may not be ubiquitous enough to be labeled “The New Black” (except on TV), but it is popping up on the fashion runways and in small flashes in our homes. We’re not suggesting that you go full retro back to the ’70s with an orange sofa, but it can add zest to your home in small doses. 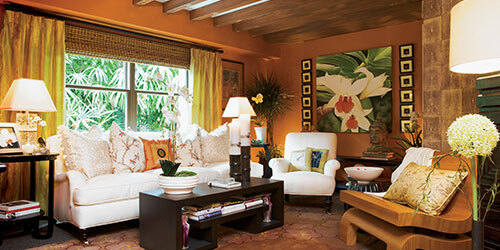 Consider an orange throw, pillows with touches of orange and contemporary art with orange as one of the major colors. If you want to go really bold, add one accent chair, nothing larger. Kravet, the high-end fabric company, is featuring several shades of orange in prints and solids. Pottery Barn features rugs, pillows and throws. Pinterest has several inspirational ideas and so does hgtv.com. “True to its name, orange in all its incarnations has a Vitamin C effect on home decorating,” according to Traditional Home. “It refreshes and revitalizes. Whether it’s a rusty burnished tone or a cleaner tangerine, orange infuses any room’s design with energy.